Our obstructionist Congress is saying that LOC Librarian of Congress nominee Carla Hayden is pro-obscenity. Consequently they are delaying a confirmation for the post (a la the Supreme Court). Report via TechDirt. “We are gratified that President Obama has chosen a qualified and capable nominee to be the next Librarian of Congress. We look forward to working with Dr. Hayden. Books are still there. What do you think? How about that headline folks? IN THE small town of Fayetteville in northern New York, you'll find the local library in an old furniture factory dating from the turn of the 20th century. The refurbished building retains hints of its industrial past: wooden floors, exposed beams, walls lined with carefully labelled tools. But instead of quietly perusing stacks of books, many of the patrons are crowded around a suite of 3D printers. One machine is midway through a pink mobile phone case; another is finishing up a toy sword. This is Fayetteville's maker lab – and it may very well be the future of libraries. In 2011, Fayetteville became the first public library in the US to set up a maker lab. Besides 3D printers, the space features a laser cutter, electronics kits, workshop tools, Raspberry Pi computers and an array of sewing machines. It functions somewhere between a classroom and a start-up incubator – a place where people from all over the region can get involved with state-of-the-art technology. Since the lab opened, similar spaces have been popping up across the country, including in cities like Sacramento, Pittsburgh, Denver and Detroit. According to the American Library Association, about 1 in 6 libraries now dedicates some of its space to maker tools and activities. The New York Public Library – one of the largest in the country – is watching these developments to inform its upcoming renovation. Yes, the repercussions from the NSA spying revelations continue. Now we are seeing looming growth in the fracturing of the Internet with the imposition of national boundaries. Even OCLC may be impacted by this. We take a few minutes to discuss the situation and its implications. A brief news miscellany is also presented. BBC News: Obama presidency: Decline in the fall? At 11:00AM EDT today, On Point, WBUR's outstanding NPR show, spends an hour asking, How Can Libraries Survive The Digital Age? The guests are Anthony Marx, president and CEO of the New York Public Library and Eli Neiburger, associate director of information technology and production at Ann Arbor District Library. The show is also available later in the day as a podcast. When a talented young visual artist walked into the public library where I work in Takoma Park, Maryland, I found out he didn't have a web page yet. The new issue of code4lib as a interesting article "Tools for Reducing and Managing Link Rot in LibGuides". "This article describes tools for managing links in SpringShare’s LibGuides, a popular web platform for libraries. LibGuides includes a built-in link checker for only some links. Instructions are provided on how to run an automated link checker on all links within a single guide. Persistent Uniform Resource Locators (PURLs), hyperlinks which are maintained centrally and rarely break, are recommended for library electronic resources. Special consideration is given to the fact that many libraries using the LibGuides platform may not have easy access to in-house information technology (IT) personnel. A method is presented for implementing PURLs entirely within the LibGuides platform." The automated link checker suggested is Xenu Xenu Link Sleuth which is fairly well known though clear instructions are given. The second part of the article using LibGuides “Redirect URL" feature coupled with "Friendly URL" feature is pretty clever though, allowing you to create a PURL using just Libguides. The public libraries in Singapore (under the National Library board) are holding a "Fill our Shelves, Suggest a Book!" contest from now until 1 July 2012. They appear to be using the crowdsourcing platform Uservoice.com that allows users to sign-in and vote and comments on submissions by others. As I write this I estimate there are about 1400 submissions (70 pages of submissions, 20 entries per page), of course quite a few are duplicates or suggestion for books the library already owns (e.g Hunger Games Series). 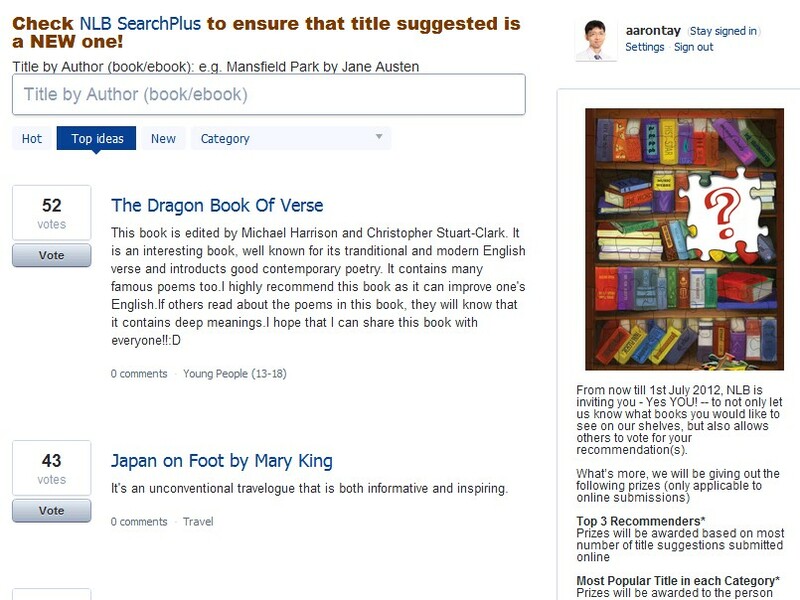 The top recommended title right now is "The Dragon Book of Verse" and has over 50 votes. I am a academic librarian, so I was curious to see which academic libraries have done the same using this or similar platforms like Getsatisfaction.